“You Asked For It” is the new video from the Edenlake Crew in Slovakia, featuring Roman Laboš, Jan Hlinka, and Richard Aufricht. Some great style and trick ideas in here…enjoy! 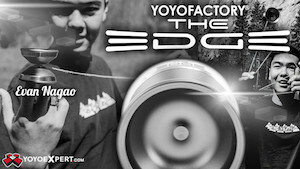 Yoyos used are the YoYoFactory CzechMate (CZM84VK) and the CLYW x OneDrop Summit. On our travels we come across some great players with some great tricks. The aim of this series of videos is to share those tricks with the world. Featuring Kento Muraoka + Ginji Miura throwing the Czechmate, this new video series from YoYoFactory has a lot of promise. Really looking forward to seeing the next rising players they showcase. YoYoFactory just dropped a quickie video shot at their European offices featuring Vashek, Gacek, and Kojo putting the new CzechMate yoyo through some tricks. Made in the USA, launched in Japan, and hanging out in Europe…the CzechMate gets around. Vashek Kroutil’s new signature model YoYoFactory yoyo, the CZM84VK, is based on the Rockstar body shape and seems to be off to a running start. Check out this video filmed during its high-profile launch in Japan during the festivities for 4/4, Japanese National YoYo Day. Vashek Kroutil travelled from the Czech Republic to Japan for the launch of his new signature yoyo the Czech Mate (CZM84VK). Filming his edit in a day we threw the Czech Mate to a few legends and some up and comers in Japan to see what they could do. Featuring Vashek Kroutil, Ginji Miura, John Ando, Reiki Sekiya, and Kento Muraoka.